CD review: "Looking Back Ahead"
This review first appeared in the July 27, 2006 issue of the North County Times. 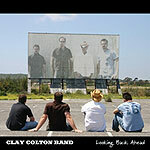 Vista's Clay Colton Band specializes in power ballads with a country-tinged rock approach. The band's new album, "Looking Back Ahead," ranges from the anthemic "Roses Don't Mean a Thing" and "Little Feet" to the tender and sentimental "Daddy's Last Dance." But the band also has the chops  and self-confidence  to knock out a spot-on cover of Neil Diamond's "Holly Holy" and take on an energetic reading of Dylan's much-covered "All Along the Watchtower." Lead singer Colton wrote or co-wrote all the other songs here, and they are solid, melodic tunes that lend themselves well to his rich voice. The lyrics tell personal stories of modern living, from being a non-custodial parent to the natural, normal heartache of watching your kids grow up and leave the nest. The four-piece band has a nice, relaxed groove to it, creating a solid foundation for Colton's vocals to soar above.